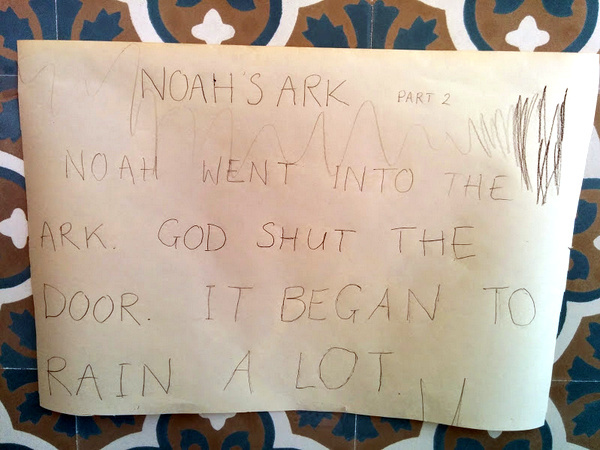 We have been doing plenty of silly rhymes about ants and pants, and the ark in the park in the dark. We’ve also been grouping words in categories, such as lists of animals, and menus of food. Then we wrote this together and read it a couple of times. When we reread it about five days later, I pointed to the letters in turn, insisting if she misread something, and I read THE each time it came up (it was new), but otherwise said nothing. The only word which gave her trouble was “squirrels”. The next time round she was word perfect. It helped that she already knew the basic story, and it helped to reread it several times. But what made the most difference was that she wrote it with me. 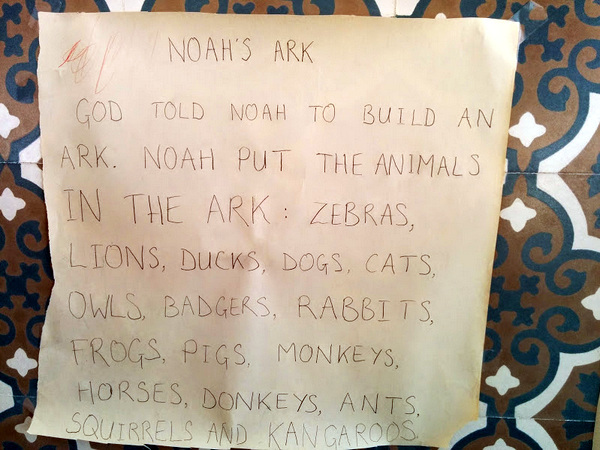 She chose from various ways of expressing the story, and of course she decided which animals got to go into the ark. It shows how a kid’s implication changes everything, as she couldn’t normally read for meaning to that level. Perfect timing for me to come across Célestin Freinet. Democracy: children learn to take responsibility for their own work and for the whole community by using democratic self-government. In fact, a lot of this ties in very closely with what Máire Mullarney believed in – Montessori, too, especially the concepts of work and exploration. Although there is a string of schools which follow Freinet’s pedagogical theory, I can see how teaching at home allows more liberty to follow it. Mullarney writes about how she taught maths as they baked cakes, multiplying the quantities for their large family. And how one of her sons learnt to read when he realised there were books about birds, his passion. I can’t speak for group-based work, as baby number 2 is only eight months old, but what I have done so far with my little Beiruti harmonises with a good few of these points, especially the centres of interest. If you set a time-lapse camera to watch the words that come and go on our terrace you’d know who we’d seen, where we’ve been and what we’ve had for dinner. I also like the idea of providing services. So now I’m out to brainstorm new ways to make learning relevant and fascinating – and helpful, why not. I got the idea for the mystery box game from a blogger who uses it to spark a guessing game when teaching English as a foreign language. The basic concept is mystery and I just adapted it for learning literacy skills. First I discreetly put an object in a large box and then we look how heavy it is and what sound it makes when we tip it. Next I write the name of the object on a slip of paper and tape it to the box (with the sticky tape that comes off easily). Motivated by the desire to discover the mystery object my daughter quickly sets to reading the label and opening the box to verify. The mystery element definitely livens things up and the game also provides a strong mental link between objects and their written name. Labelling objects with post-its does too, and we’ve played at reading labels and then sticking them on the relevant objects all around the house, but the idea of an item hiding in the box waiting to be found provides higher motivation. We then moved on to hiding an object of my daughter’s choice in the box and writing the name of it in French to take to her dad to discover. I had to guide her choice of object to things with simple names (sac, bol, etc). I thought that seeing daddy accurately guess what had been secretly placed in the box would drive home the wonder of literacy, the way it can evoke so efficiently what is unseen. However, at 2 and 3/4 I think she still believes us to be all-knowing and all-seeing (long may it last). What’s more she had trouble not telling daddy what she had put in the box well before he got close enough to read the label. Nonetheless, she had a whale of a time sharing her game while shouting out the contents. 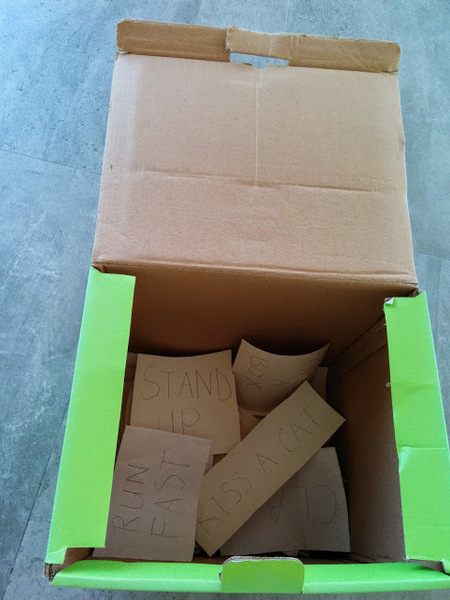 The next phase was to turn the box into a lucky dip of actions. I wrote messages like jump, hop, run fast, get a cup, sit down, stand up, put a peg in a box, hug mummy, and so on. We take turns drawing a slip of paper, since that adds to the suspense, but we both do the actions together. I would never have thought teaching my daughter to read would leave me this breathless. A random note on the side: I have known a couple of children who will write their name backwards – a perfect mirror image. When it came to ‘GET A [top line] CUP [bottom line]‘ my daughter surprised me by reading: A TEG CUP. So she still needs reminding occasionally to start from the top left. I won’t be starting on Arabic just yet. One morning this week my daughter had just (slowly) read “window” and then went in a corner to scribble a row of swirls on the terrace. “I wrote ‘window’”, she announced. “Nice,” I said, looking at the swirls, and trying to think of a reasonable word to suggest: “You could write the word CAT if you want.” I wrote the C and made room for her to copy it below. She started with a diagonal line. I outlined the curve of my C again and she did a wobbly C of her own. Next the A, which didn’t quite meet at the top. Then a fairly respectable T.
This isn’t the first time she has written letters. Even back in Beirut she was pointing out the Ns or As which emerged unintentionally (I assume) from her scribbles, so a year ago, well before her second birthday. But this was the first time we attempted to line up her letters in a word. Actually I haven’t put much emphasis on her writing her own letters at all as I can see it is hard work whereas reading is pure pleasure. It’ll come later, maybe when she is three or four. Or so I thought. After lunch and nap time and all sorts of distractions, we were once again on the terrace. I had my laptop. She came asking, “Can we write HAT?” “Sure,” I said, thinking she wanted me to write it for her, even though it seemed a bit simple for a kid already reading words like rabbit and basket. So I began writing H. “Like over there!” said my daughter. When I looked where she pointed, there was H and A already lined up. She had already started writing HAT. “What’s the last letter that’s missing?” I asked. 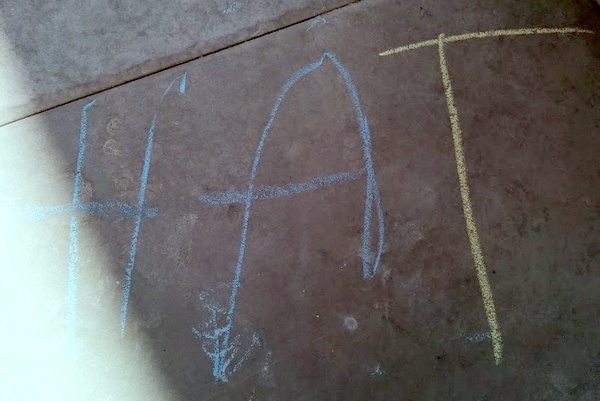 “T” she said, “like cat.” And she took a new piece of chalk and added the T. And that was that. Clearly the cat in a hat which sat on the mat deserves some credit here. All of the “three Rs” seem to be developing rapidly right now. She began reading two and a half months ago, and funnily enough both writing and arithmetic made something of a début this week. More on the numbers another time, but if anyone has any experience with Colour Factor or Cuisenaire Rods feel free to share, as I think it will be my next purchase on Amazon.